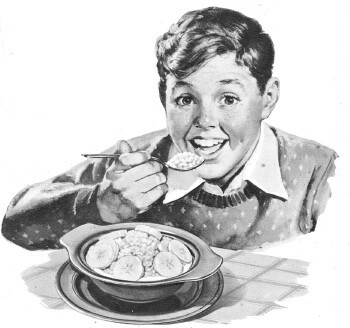 Recently, I put on-line a series of Quaker Oat sponsored booklets from the 1940s and 1950s discussing basketball skills for young boys (and girls). This was one of those offers you see in magazines where you send off for the booklet free of charge. There was a board of mainly college and high school coaches who contributed to this, although one coach was given top billing. In the early days it was Kentucky coach Adolph Rupp, but in the early 50's this was switched to Oklahoma A&M's Hank Iba, then UCLA's John Wooden and later University of Illinois coach Harry Combes. Here's an example of a common cover. Here's the link to four of the pamphlets under Rupp's name. (I also have a pamphlet under Iba and Wooden's name.) If you follow the links, you can see the full text/illustrations of these. I had a couple questions about these if anyone knows. 1.) Can anyone confirm that 1945 was the first year of publication for this, or whether there were earlier editions ? 3.) Does anyone know the backstory as to why Rupp ended his association with the pamphlet ? The 1951 edition was under Rupp and the 1952 edition (with the exact same wording except for the bio part) was under Hank Iba. I'm not sure exactly when during the year the pamphlet was published but if it had anything to do with the point-shaving scandal, it would have had to been very late in the year, as Kentucky's involvement in that was only made public in October of 1952. I should note that in the 1952 edition, Rupp is still named as part of the committee. 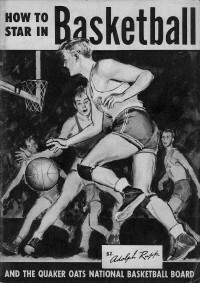 In Wooden's edition a few years later, Rupp was no longer listed. 4.) Can anyone say for sure how long this booklet was published and who else may have been a part of it. 5.) In the early days and during the booklet's main development, Rupp was given top billing. I've tried to ask how much of the text came from Rupp himself versus contributed from the other coaches but it's almost an impossible question to know. Anyone happen to know anything about this ? This is just related, sort of. In the 1950s, Quaker Oats hosted a league in Cedar Rapids, Iowa, had a "girls" team of their own (indie, lg. , AAU), and had a women's tournament. This is the two court 6-on-6 game which was huge in Iowa. Is it Akron, O. where Quaker Oats plant is now a big mall?